This essay opens the conversation in a book I will be releasing in 2017. My grand-nephew James was celebrating his birthday, yet he felt awful and very sad about being nine. He wished he could stay five years old forever. When asked why, he replied that if he could stay five then the Earth would not explode. His lips quivered and the tears welled up in his large brown eyes. He said, “I don’t want to grow up and live in a world that is burning.” In the silence that stretched between us I wondered what to say. I could not say that everything will be OK, that my generation will fix things. He was much too intelligent for such placebos. So I spoke to him about the mindfulness community I created in 1997 – Pine Gate – and the deliberate steps taken for planetary care. We simplify, make do with less, share and adapt. Our intent is to create environmental leaders and that includes him. “Why not become a leader for your generation?” I asked him. He thought about that intensely and asked what else did Pine Gate do? I pointed out that Pine Gate encourages Voluntary Simplicity and Community Ethics as a way of life. We start with the Earth. Our organic garden produces an abundance of vegetables, apples and flowers that are shared with neighbors and community members. It is a solace for me to spend time with the Earth, observing bumblebees and butterflies while gardening with assistance from neighborhood children. I told James that the kids once went into hilarious laughter when they saw that the plant I had carefully nurtured turned out to be a giant weed and not a tomato plant! We had great fun returning it to the compost bin. At the back of the garden is a beautiful fountain that murmurs ‘midst the flowers, which are picked and sent to the elderly folk living on our crescent. A simple underground economy arises from the sharing. A solar panel on the roof fuels the hot water system. Everything else is as eco-friendly as we can make it for our fifty year old bungalow with a meditation hall in the basement. This eco-effort has become an example for other friends as they do the math on how much cash we are saving and implement something similar. Our focus is on mindfulness in schools, city environment, teens at risk and on the empowerment of women. I admitted to James that I am blown away by the results, for at the local level there were great women who helped make things happen. “You mean girl power?” asked James incredulously. “Exactly that,” I replied. The drive behind Pine Gate is to foster a strong cadre of people in Ottawa to make a difference for the betterment of society and the Earth Mother. Women are in the forefront of this endeavor. They are the heart that holds the living waters and that heart is the dynamic epicentre of the mind/will/emotions that lead to effective action. That is how we get things done differently to create a different course of action and living. James was taking it all in. He knew instinctively that major changes were needed. I intimated that when enough of us change, then we will be in charge. I told him about a speech I gave about violent consumption. His sharp mind held on to every word as I pointed out that festive occasions like Christmas provide opportunities for the best and the worst within us to come out and play. Yet compassion and kindness are quickly overshadowed by greed, selfishness and consumer madness. We need to re-assess, as it is time to move on from being self-absorbed and distracted. “How?” he asked again, as he really wanted to know. So I gave him this list. Locate in something bigger than oneself; a humanitarian cause, respecting the earth, making our thinking better, being kinder and more generous. How about examining our habits about gift giving and learn to give gifts that make a difference? I pointed out to James that I no longer buy Christmas gifts, instead present gift certificates in the name of family, grand-children and young neighborhood friends. These gift certificates provide items like education for a girl in Afghanistan, micro-loans for female led families, rebuild forests in Haiti, literacy packages and mosquito nets where needed, support for Habitat for Humanity building houses for the destitute and so on. Such gifts are bigger than our self-absorbed egos and create happiness for less fortunate people. I related to James that my grandchildren proudly take their Christmas certificates to school for Show-and-Tell periods. They play it forward with their class mates and teachers. One boy on the crescent where I live had received such gifts from me for several years. For his most recent birthday he asked all his friends not to give him presents, but to bring a donation for the Ottawa Humane Society that looks after hurt animals. All of his friends brought donations, a splendid sum of one hundred and eighty dollars. They all went together to the Humane Society and happily handed their bag of cash to the surprised staff. Other children in the neighborhood have followed suit. This resonated with James and he said, “I could do that with my ice hockey team. My dad is the coach and he would help.” He waited for me to continue. I said, “James, the greatest gift we can give to ourselves and others at this time of global crises is Sharing and Caring. It involves stepping onto what the Buddhists call the Bodhisattva Path.” (James knows that I am a Zen teacher.) I explained that a Bodhisattva was a person who stayed in the global mess and did their best to awaken the minds and hearts of people. I firmly stated that it is time for the Bodhisattva-within-us to enter the 21st century as the example for action. It takes training, practice, smartness and creative vision. “You mean like Jedi training?” he enquired. I nodded with a smile. I referred briefly to my years of training in ashrams and monasteries in India and France and with Native American medicine people. But I confided that the real kicker for me was the time spent alone in the Canadian wilderness. I promised to talk to him about this at some future time. Then he asked, “So what is the big deal about violent consumption?” I replied that it totally dominates our planet, mind and body. I knew that James’ greatest fear was about the planet’s ecological crises, from mining disasters in Brazil and China, wildfires in Canada’s Boreal forests, Amazon deforestation – all the way to the Gulf Oil Spill where tons of toxic oil dispersants settled on the ocean floor contaminating the oceanic ecosystem. “How do we change this mad destruction of the planet?” James exclaimed. I wondered how best to explain matters to him, yet trusted his intelligence. I said, “We must stop, locate ourselves in stillness and make different choices by examining our minds, consumption patterns and then see how we actually participate in creating these terrible disasters.” I noted that this kind of awareness takes us back to what we do with our minds. “Just how?” was his one line mantra. “Walking meditation is a good start,” I said. I explained that when we concentrate on our breath and focus on slow walking, we have a brilliant piece of engineering to quiet the mind and body and be clear. When we add a third concentration of being aware of how our feet touch the earth, we have a meditative practice for our troubled times. We focus our mind on the mechanism of each foot touching the earth: heel, then ball of foot, then toe. We slow down even further and with our body, not our intellect or ego, make a contract with Mother Earth to leave a smaller footprint. The energy of wellbeing that arises from this practice of walking meditation is stronger than the stuff of our mental afflictions. We can then examine our consumption patterns and energy use with clarity. I told James that nobody requires a lecture from me, for we do know how to reduce our ecological footprint. We also know that taking care of the earth and the oceans takes care of ourselves. We must begin it now for the future, which is our tomorrow shaped by the actions we take at this moment. I looked at James and indicated that was plenty for him to digest, but he yelled, “No, I want to hear more.” I could not turn away from his eagerness. I mentioned that if rampant consumption remains our deepest desire we will have a degraded planet that will certainly blow up. His fears were correct. Valentine’s Day, Easter, Christmas, Mother’s Day and so on are targeted by the captains of industry for optimal retail returns, and mindless consumerism is fuelled to the max. At Christmas we are far removed from remembering the significance of this spiritual celebration. Endless economic growth, the mantra of modern civilization, provides a promise of expectations being met without any awareness of consequences for our own health or the health of the planet. Our current non-sustainable energy and economic systems are subsystems of a global ecology that is disintegrating before our very eyes. If we do not simplify, make do with less and change, then the vicious downward spiral to a burning world would definitely occur. “That is so gross,” remarked James. I told him that we can change our minds and patterns of food consumption. We re-educate and retrain ourselves mentally and choose to support our body and planet by shifting deeply ingrained food habits. It takes training but we step more lightly on the planet. It means reducing as much as possible the violence, destruction and suffering brought to living creatures and to the planet. If we bring violence into our own biological system and consciousness, then we inevitably bring violence to all the other systems that we engage with through our thoughts, speech and actions. “Is this your Buddhism?” James asked. I smiled, “The Buddha was very smart. He taught that the world is always burning, but burning with the fires of greed, anger and foolishness. His advice was simple; drop such dangers as soon as possible. What the Buddha taught was that it was the unskillful speech, selfish feelings, negative mental formations, wrong perceptions and badass consciousness that burned, and not the world itself. James laughed, “Did the Buddha really use the term badass?” I grinned and said that was my embellishment but pointed out that the Hopi people also referred to the burning as a state of imbalance known as Koyaanisqatsi. We are not the first people to experience this. The difference today is that without our commitment to wise intervention, we could be the last. “Is climate change our basic problem then?” he asked. I emphasized that the disasters all over the world interconnect and reinforce each potency to explode. Whether it is wildfires, floods, landslides, volcanic eruptions, hurricanes, tsunamis, millions of aquatic creatures dead on beaches, it goes in relentlessly. The media and news reporters cast science to the wind when they report the drama and hype of terrible things happening world-wide but rarely tell the truth that, “Here is another manifestation of Climate Change.” News programs are just showbiz and journalists mere pawns to corporate interests that are culpable in the first place for creating the tipping points that cause the interconnected disasters. So the general public are not educated by the media about the calamitous realities happening on our planet. That is a big obstacle. The other obstacles preventing the general public taking wise action are a mixture of fear, despair, sheer laziness, disempowerment and a sense of hopelessness. “What on earth can I do to make a difference?” is a phrase muttered all over the world in countless languages. Followed by “So why should I do anything?” There is certainly global awareness, but also fear about our future place on Planet Earth. This is all understandable, which is why you wish to remain five years old forever. The difficult thing for you to grasp is the clear evidence that we are the primary cause. I confessed to James that in my previous books I underestimated the impact of the carbon fuel cabal, a complex web of powerful corporate and government interests. This carbon economy extends into the manufacturing and servicing sectors, supported by insulated financial institutions that control the marketing and advertising sectors. This collective power, when extended into the media, has attempted to make science and ecology into public enemy number one. This powerful, intermeshed cabal can easily circumvent the Climate Change accords agreed to by the international community. People everywhere are aware, but just feel helpless in the face of this power. So what are we to do? James shrugged in exasperation. “Here’s the thing,” I said. “In terms of action, we have clear data-based evidence that we must cut back, make-do with less and implement a lifestyle of voluntary simplicity. So, where do we start? Of course we must think globally and be aware of the bigger picture and step beyond the smaller pictures of ourselves created by fear and disempowerment. But we can also act locally with great vigour in our families and communities. Our intentions then spread as ripples from a pebble dropped in still water. Then we can hold officials, politicians and corporate culture to account. We alert the political and corporate decision makers that we mean business as voters and consumers deeply concerned about the planet and our location on it. This is very important. “Wow,” exclaimed James. “OK, I get it about training but what does it look like?” I was relieved by his intelligence and proceeded to talk about “Gardening in the Mind.” I offered him eight simple steps to refine the mind then engage with the world. Focus on and soften your heart – cultivate the soil of your mind’s garden. Water the seeds of mindfulness at home, work or in solitude. I assured James that we are equal to the task and I chose not to hold back anything from him during this long conversation on his birthday. He is an unusually bright boy and asked questions and demanded clarification. Yet I knew he had grasped what I had said. He came up to me as I was leaving and whispered in my ear that my chat with him was his best birthday present ever. Pine Gate is a Zen Buddhist community practicing Engaged Buddhism inspired by Thich Nhat Hanh, the Dalai Lama and Sulak Sivaraksa. It has created an engaged expression for peace, social justice and planetary care as the community is the nucleus of Friends for Peace. The coalition, with Pine Gate at the core, has since created annual events to celebrate peace, social justice and planetary care. 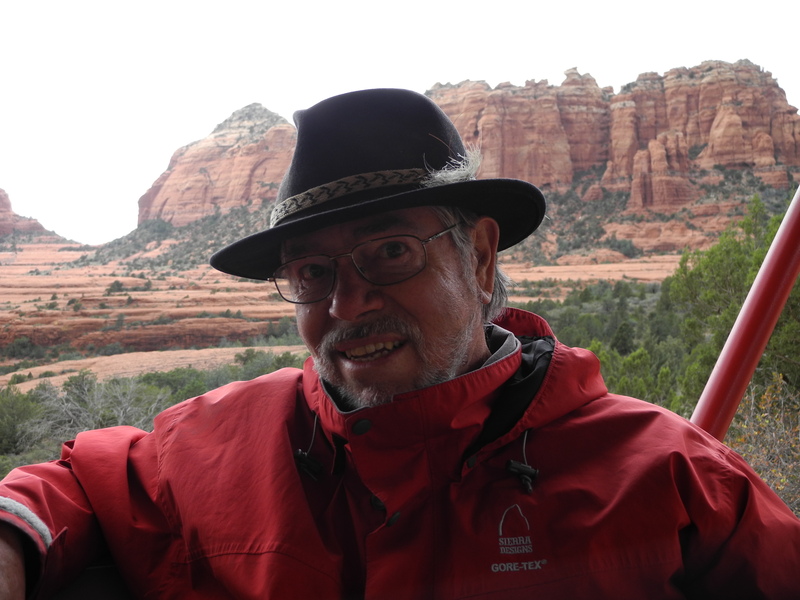 The resident teacher is Dharmacharya Ian Prattis – True Body of Wisdom. Ian is a poet, scholar, peace and environmental activist. 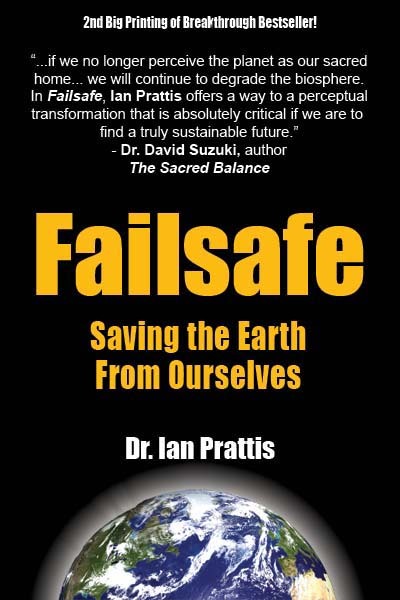 As a professor at Carleton University he taught courses on Ecology, Symbols, Globalization and Consciousness – reflected in his 2008 award winning book: Failsafe: Saving the Earth from Ourselves. He encourages people to find their true nature so that humanity and the world may be renewed. He has trained with masters in Buddhist, Vedic and Shamanic traditions. Pine Gate, located in the west end of Ottawa, had very modest beginnings. Inaugurated in 1997 following Ian’s return from teaching meditation in India, early gatherings featured Ian, Carolyn, and their pets – Nikki the dog and Lady the cat. Since then it has blossomed into a vibrant community. In the summer of 2001 major renovations took place to the lower level of their home. A new meditation hall emerged from the dust and knocked down walls – the Pine Gate Meditation Hall. Zen Master Thich Nhat Hanh provided a gift of calligraphy naming the Pine Gate Meditation Hall. This now hangs on the wall for all to see. The meditation hall has become a source of sanctuary for friends from many traditions. There are three seasons at Pine Gate – the Fall Study Session from September to December, the Winter Study Session from January to May, and the Lazy Days of Summer program from July to August. June is recess and quiet time. The bottom line at Pine Gate is the practice of Silent Meditation, Zen style, every Thursday evening from 7pm – 8pm with tea afterwards. The First Saturday of each month provides a Day of Mindfulness. The gathering on Saturday September 3 ushers in the 2016 Fall Program. It is an opportunity for socialization, dharma and pot luck vegetarian supper, 5pm – 8pm. Dharma talks, discussion, mindfulness trainings recitations, sutra study, deep relaxation, Q & A, ceremonies and other practices will follow on further Days of Mindfulness. On occasions the supper will be a formal meal. Hikes, Sweat Lodges, Pilgrimages, and Meditation Retreats are also organized. The voice of the sangha can be heard through its quarterly Buddhist Journal – Pine Gate – which appears three times a year. Quirky! Our engagement with society and the environment rests on our quality of being. When that quality is rooted in stillness and silence there is a different ground for subsequent actions and so events take a different course. We simply go home to our true nature. We are very active in this way and bring harmony to those we interact with. The most significant interaction is with our true nature. To connect to its boundless quality in daily life, and then to connect to others and the world in the same way is surely the ticket to ride! The Buddha brilliantly created the initial form of sangha but I do think he would not have wanted it to stay the same as when first established 2,600 years ago! The change of form in sangha practice at Pine Gate emphasizes the power of deep silence. From my yogi training in India I believe that that once one can be truly silent all aspects of mindfulness fall into place. You do not have to fight your difficulties. Silence allows it to leave you. Alone with silence and all that is generated by the imperturbable silence of the Buddha and masters like Ramana Maharsi, the way is paved for bodhisattvas to emerge. This evolving ancient form, resting on deep silence, brings to us the transmissions that the Buddha and Ramana Maharsi made available. DIRECTIONS: In Ottawa, take Queensway to Woodroffe South exit; go to Baseline Rd; RT on Baseline; RT on Highgate (2nd lights) RT on Westbury; LT on Rideout and follow the Crescent round to 1252, which is always lit up with Christmas lights in the winter and full of flowers in the summer. Attendance is by donation according to means. Ball Park: $5 – $10. I was actualizing the spirit and the letter of the OI charter. Thay gave me a driver’s license and the keys to the car and I drove it as far and as fast as I could. There was plenty of creativity and experimentation though I was initially lacking in skilfulness. In my sense of urgency I kept the gas pedal to the floor and went flat out at high speed – this was not wise. I quickly learned that action followed consciousness, not the other way round and so I eased up on the gas pedal! My grounding was in Pine Gate Mindfulness Community, founded by Carolyn and I in 1997 after my return from teaching meditation in India. Sangha life was a subtle ebb and flow through a series of concentric circles. At the core was the practice of sangha leaders (Carolyn and I), the next circle was senior OI members and aspirants, then a circle of sangha members committed to the Five Mindfulness Trainings, then a circle of sangha members young and old, and then extending to a vast circle beyond the boundaries of Pine Gate to the wider community. The ebb and flow between concentric circles breathed us in and out and the energy generated became the basis of action. A good alternative to keeping the pedal to the floor! An unusual set of circumstances led to a particular form of engaged action. This is not a blueprint or a formula – just what arose from the depth of sangha practice in the midst of global crisis – the international war against terrorism and Global Warming. The beginnings of Friends for Peace began with the outbreak of the Iraq war in 2003. Friends from across the city of Ottawa worked together together and organized candlelit vigils all across the city prior to the outbreak of war. Over 3,000 people responded to this hastily put together initiative. We also organized a Peace Song Circle on Parliament Hill, the seat of Canadian government, to send the strong message that mindful living was preferable to the warlike alternative. Pine Gate members provided the nucleus for this nascent movement. The organization of this event was left in their care as I left for two months in India just before the event took place. It was in highly competent hands. On a cold, wet March day in 2003 a sea of multi–colored umbrellas adorned the grounds of Parliament Hill. 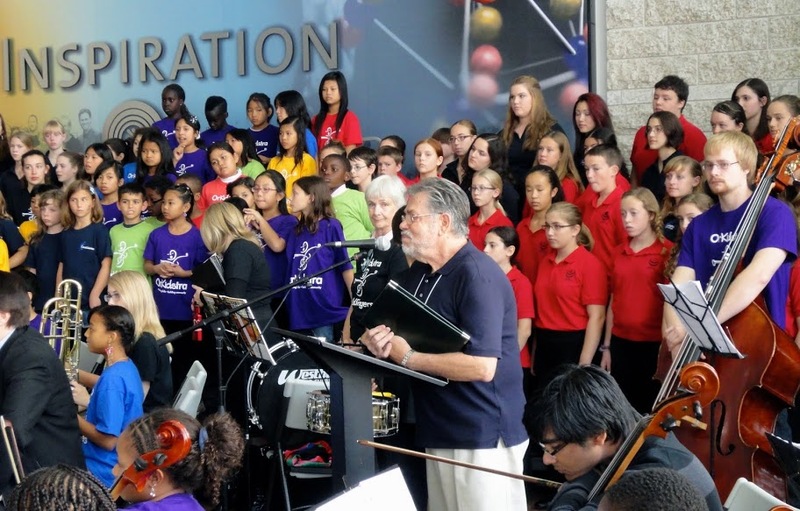 Choirs from all over the National Capital Region were there to give their hearts for peace. Earlier that morning I had received news of the shock and awe bombing campaign of Baghdad – and was filled with anger and grief. This was not the appropriate mind state to lead this event, so I took refuge in the sangha. Carolyn took care of all the final arrangements, while I did walking meditation in Pine Gate Meditation Hall to calm and look deeply into the causes of my anger and to let it go. Then I could be peace. The incessant rain symbolized the tears of Iraqi children, your tears, my tears. Young, old, multi faith and diverse – the faces in the rain moved me deeply as people sang, danced and stood up for peace. The NOWAR group was due on Parliament Hill after us and they had a more violent agenda. I had talked to their leaders and requested that they join us on the Hill but without noisemakers and slogans. They came with anger after burning effigies of George Bush and Tony Blair outside the US embassy. We felt the anger of their demonstration as they joined us, then it suddenly calmed and dissipated as they sang and danced with us in the downpour. The Sufi Universal Dances of Peace group organized 5,000 people to do a dance, chanting “May Peace be With You and With You be Peace” in English, French, Hebrew and Arabic. 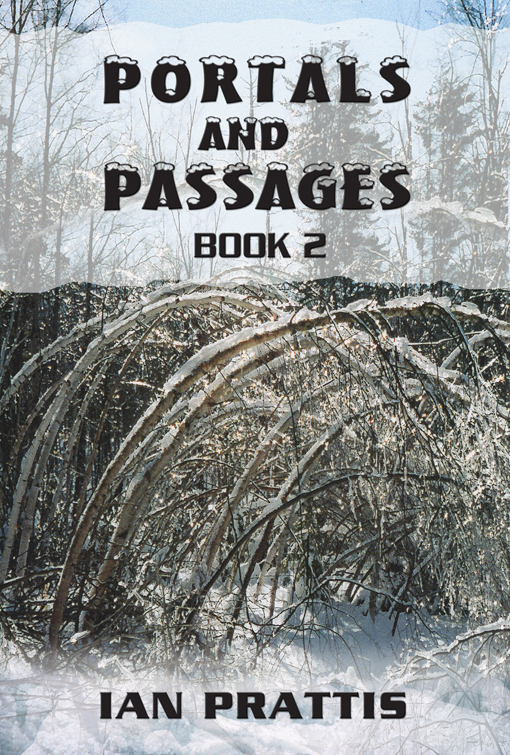 When the rain came down like a monsoon – nobody ran for cover. We danced and sang for peace together. The NOWAR group meditated with us in silence at the end. From the response to these events Friends for Peace was created and registered as a non profit organization with a mandate for peace, planetary care and social justice. It has a charter and a mandate. All parts of the mandate are active with respect to outreach, support and action. The first thing put into motion was an annual Friends for Peace Day every Fall, which was a celebration of all that we stood for. 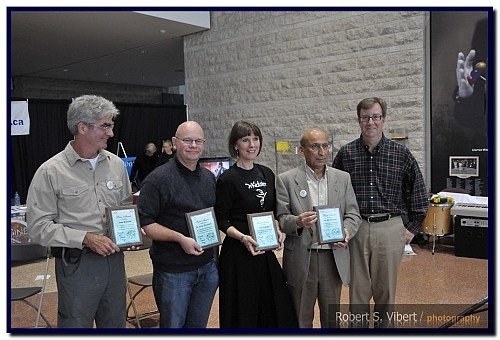 It had the feeling of a country fair with lunch kitchen, activist tables, Silent Auction, great entertainment and Peace Awards to prominent citizens who delivered their often very edgy Visions for planetary care, social justice and peace. Peace Grants were also awarded to organizations making a real difference. This day has now grown into the final bookend of a two week Peace Festival in our city of Ottawa. The growth and enthusiasm is there because there are tangible results from each area of the mandate. There is a new six storey apartment building for low income families downtown that we supported, there is a pristine watershed – the Dumoine River – that we helped to get protection for, there are direct results from our support of aboriginal rights in the apology from the Government of Canada to First Nations, there is the annual Peace Camp Canada bringing Palestinian and Israeli teens to Ottawa for a peace camp. 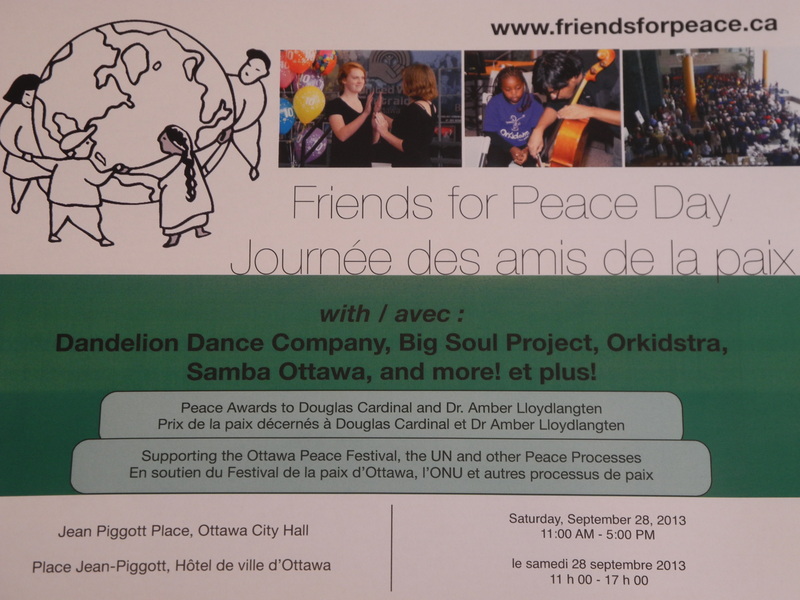 And much more that is unfolding – the promotion of Orkidstra and the Dandelions Dance Theatre, Tibetan and Syrian resettlement in Ottawa and many other causes. The confidence from doing all this has led to the sanghabody jumping into the river of the Buddhadharma and kindly carrying me along with them. This is all due to deep internal practice and intelligent engaged practice. The home of Pine Gate had a major eco-retrofit – solar panel to heat the hot water, low flush toilets, energy efficient furnace and wood burning fireplace, energy windows and doors, solar blinds on south facing windows, insulation, rain barrels and so on. The neighbours and sangha are watching very closely and enquire about cost, rebates and results – and several have followed suit. Our money is where our mouth is, as this is a planetary care project right at the heart of Pine Gate, which is also the heart of Friends for Peace. And on it goes all the way back to the hearts of Thay and the Buddha. I have also planted an apple tree on the front lawn, so that as the fruit ripens passersby and neighbours with their children may just pick them and eat them. There are many ripe fruits on the sangha tree, especially young people. They are storming the barricades, transcending boundaries and breaking down barriers. I ask only one thing, that they hold out their hand and wait for me – because I am going with them. A Speech from the Future. 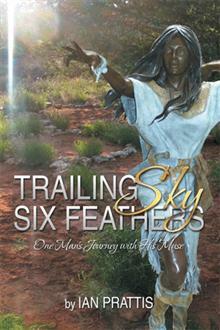 I am writing the final book in a trilogy, taking characters from Book 1: Redemption and Book 2: Trailing Sky Six Feathers and placing them on a new planet in the near future. The adventure allows me to look back on the factors that compromised life on Earth. Here is an extract from Chapter Two. “Ten years earlier Dr. Tom Hagen gave a speech at the United Nations in Geneva, Switzerland. Gathered before him were political and corporate leaders from around the world. He was an astrophysicist, engineer and prolific author. He wrote searing plays about human fragility and books for children to inspire them to care for the earth. These endeavors did not turn the tide of willful ignorance concerning drastic climate change despite his creation of detailed plans and scenarios to adapt the Industrial Growth Civilization that imperiled life on Earth. He was also the chef-de-mission of the International Space Agency’s PRIME 3 project to locate a suitable planet, as habitation on Earth was seriously compromised. The entire project was outlined in Space Agency folders that each member of the audience had before them. Dr. Tom Hagen was standing quietly at the UN podium in Geneva, readying to speak. He had both good and bad news for his powerful and wealthy audience, deeply hoping that some of them would finance this late opportunity for survival of the human species. Tom looked at his carefully researched notes then put them to one side. This speech, the most significant of his life, had to come directly from his insight and heart. He composed himself, standing still and silent at the podium He was six foot three inches of intense focus, dignified and alert. He took his glasses off and placed them on top of his notes. Sian, his wife, sitting off to one side of the podium smiled in relief. She knew what was coming. Tom paused and looked around at his audience, one he did not particularly like, but one he had to convince. He breathed deeply, waiting until he felt that icy steel of reason and vision within him, then he began to speak. Tom paused for several silent moments and made eye contact with the few individuals there who would support him. He breathed in and out slowly, gathering his steel and his wits. He saw that the facts he had just delivered registered with some and set the tone for what was to come. He slowly took a drink of water from the glass in front of him. There was another pregnant pause, as Tom allowed the indignation to arise from his audience then fade away. “Do you remember the famous one liner from Bill Clinton that won him the presidential election, ‘It’s the economy stupid.’ You surely must, as you have put it whole heartedly into practice. That was the wrong direction. Your brand was, and is, a dysfunctional global financial system lurching from one disaster to another throughout the century. May I remind you of the obvious. The economy is a mere sub-set of the mother lode of ecology and you have successfully destroyed that base source. On your watch not only did financial collapses signal dangerous global watersheds, the world food system crashed as a consequence along with the chaos brought in by climate change. Nobody moved to ask different questions and find different answers. The usual suspects were hardly reined in. A few were assassinated, some rotted away in prison, while others died shallow deaths in gated communities. The anger of the populace has turned on their more powerful masters of capital and politics. At the extreme end of the spectrum of violence this anger has boiled over into lynching and murder of corporate and political leaders held responsible by eco-militias. The heinous actions of these black clad anarchists are certainly an extreme response to your control, lies and doublespeak. Nevertheless it is a response that makes none of you safe. Look back over this century and you can see why such violence has emerged. Thousands of millions of people have died from thirst, starvation and disease. Death arrived from every pestilence available, some of it created in your counter-intelligence labs. The countless millions who have died do not include the many wars waged over scarce resources, particularly water. The reason for such wars lies with your greed for money, control and power leading directly to the cascade of disintegrating eco-systems essential for the support of life. Government, industry, banks and financiers grew wealthy while they permitted a systematic breakdown of failing ecosystems on Planet Earth. Your collective and willful ignorance of warnings since 1950 served to discredit climate change scientists and oceanographers screaming that ocean eco-systems were disintegrating. You silenced and jailed citizens with the integrity to save the Earth. But it was never about the unanimity of scientists or free speech. It was about the brand of economics favored by your fossil fuel complex – a collective cabal of extraordinary power. You do know who you are, as you single mindedly created a powerful culture of denial about climate change and how it has impacted the cryosphere to such deadly effect. Social order broke down in mid-century ushering in the overthrow of governments, the establishment of martial law and Nazism – all of which increased the desperation of populations worldwide who took to the streets in mass riots. In the vacuum of social order vicious warlords and militias took over many parts of the world. You have all suffered from the violence of so called eco-militias, which hunt down and string up in the streets those politicians and corporate leaders they hold responsible for the collapse of Earth’s eco-systems. Let me be clear – these eco-militias do not serve the Earth. They are pathological criminals on the loose, yet in many parts of the world they constitute an ever present danger. You and I have lost many friends and colleagues to the murders they have carried out. They are extreme, just as you are extreme. Somehow you inherited the Nero gene – fiddling with indifference while Rome burned. The entire planet has been allowed to burn on your watch. Perhaps at this late stage you can learn something from Rumi, the Sufi saint. He said, ‘Sit down and be quiet. You are drunk and this is the edge of the roof.’ Your policies and brand of economics have forced humanity off the edge of the roof and you can now see the consequences worldwide. In Canada, Big Oil and government ran an incredible campaign to promote the Alberta Tar Sands. They produced images of reforestation, utmost safety, deep concern for wildlife, populations and clean water. This played to a receptive audience throughout the country. Decades later the northern rivers and lakes of Canada became a wasteland. Oil derivatives swiftly poured through interconnected waterways. Aboriginal populations that augmented their households with fish and game are no more. They either relocated or died. This format, however, provided an example that was quickly adopted by other governments and effectively torpedoed any form of transition to a sustainable, renewable economy. Tom paused and took a deep breath before looking around the audience, connecting with all his heart to each person. 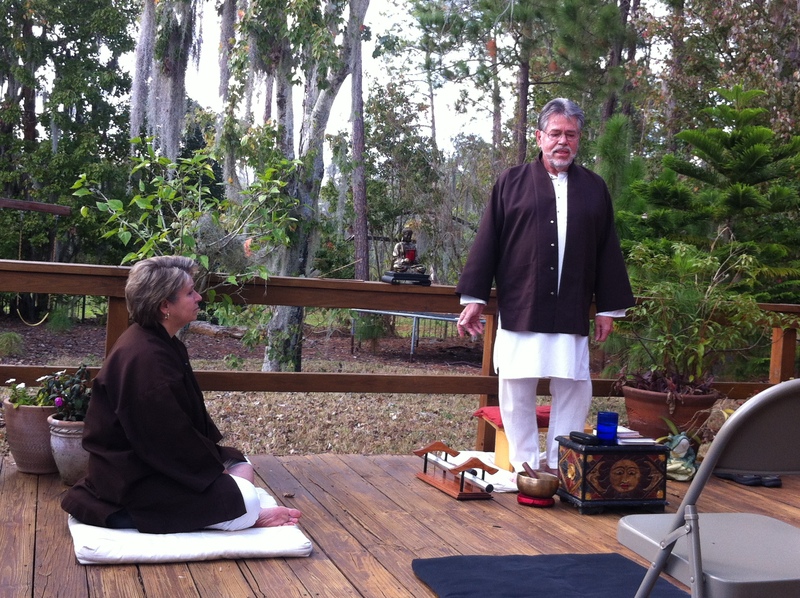 I offered 10 days of mindfulness practice in November to the Fish Lake Sangha in Orlando, Florida. 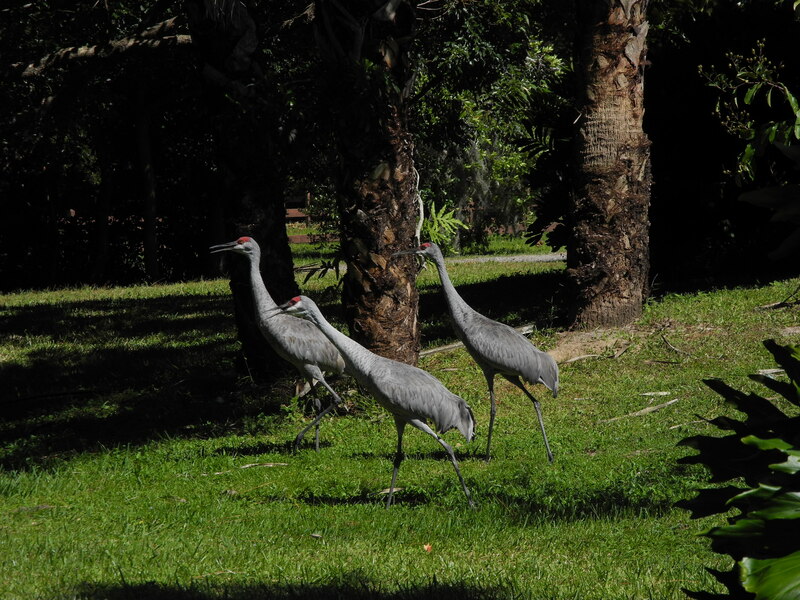 Imagine my surprise to be greeted at the lakeside by Sand Hill Cranes who honked every time I started a dharma talk! They are wonderful creatures, totally unafraid of the two legged walking with them and taking photographs. 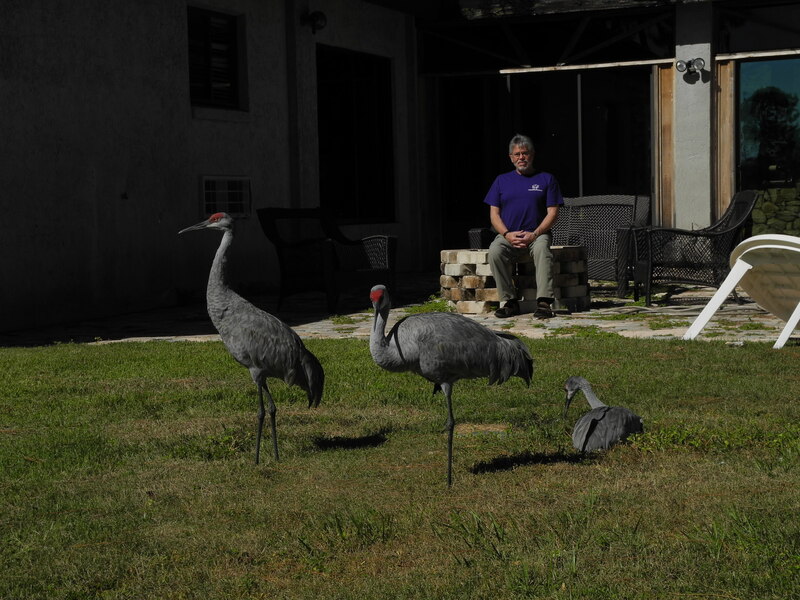 On the first Saturday we greeted the morning and the cranes with Zen Practice. Zen Practice has a very practical nature – Chop Wood, Carry Water – and being aware of precisely doing so. The cultural origins from China and Japan do not necessarily travel well to western countries, so I have adapted the form somewhat and kept the essence. We listen to the bell calling us back to our true selves for guidance, listen to our breathing and through the discipline of this practice we settle into a deep calm and harmony with everything around and within is. The simplicity and elegance of silence. The cadence of sitting with breathing in and out, the flow of walking with breath – in and out, the joy of stretching with breath in and out. Then repeat the entire cadence three times. The silence deepens as we settle gently into the quality of our mind. Nowhere to Go, Nothing to Do. 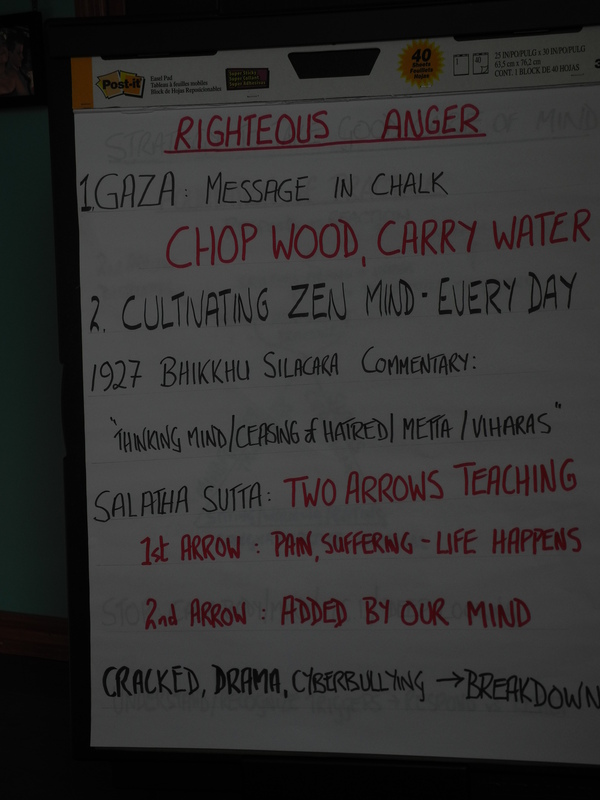 The first dharma talk to the community was on the topic of Righteous Anger. All such conflicts require the active and intentional cultivation of Zen Mind to navigate the pitfalls of hatred, distraction, violence, past wounds. We deal with the fundamental pollution – in the human mind. Making the world better requires that we make our minds better. The task is to make our thinking better. Navigate more skillfully. The Four Brahmaviharas meditation is a good tool, all children’s songs an effective antidote. Foundation Practices and the Two Arrows teaching. A recent protest in Antigonish, N.S. supporting Gaza produced yelling hate, violence and anger. There was a woman standing apart with a list in one hand and purple chalk in her other hand. She was carefully and quietly writing down on the edge of the sidewalk of Main Street, Antigonish, N.S. the names and ages of every child killed in the Gaza bombardment. My question to you is: Which protest do you think had the most impact? During the week there was a session of qi-gong with Carolyn and a Transmission Ceremony of the Five Mindfulness Trainings – a step into living the Bodhisattva Path. When I invited the 5 aspirants to come to the front and offer bows to the three gems, they spontaneously held hands and bowed together. Very sweet, a great omen for what they will bring to the sangha. The day of mindfulness on the final Sunday began with silent meditation and the 2nd dharma talk, Collapse and the Bodhisattva. I spoke about the breakdown of Industrial Growth Society. Staring into the abyss. No limits, no maturity. From Columbine to Newton, CT – the killers are pre-adult males with mental illness – the immaturity of the Carry Movement – NOT defense of 2nd amendment rights. The solution – STOP; RE-ASSESS; ENTER THE BODHISATTVA – NOW with interbeing and non-discrimination. Shantideva’s unwavering encouragement from the 8th century. Buddha Mind. “Ego” is very disappointed with Awakening – so let us all disappoint the ego. I finished the talk by reading the Hopi Prophecy of 2008. Carolyn led everyone through a qi-gong session prior to a Silent Lunch ushered in with the Five Contemplations before eating. The next edible item was chocolate meditation which followed walking meditation outside by the lakeside. Carolyn spoke about the causes and conditions that brought the wrapped chocolate to each hand and the vast population it had touched before landing. 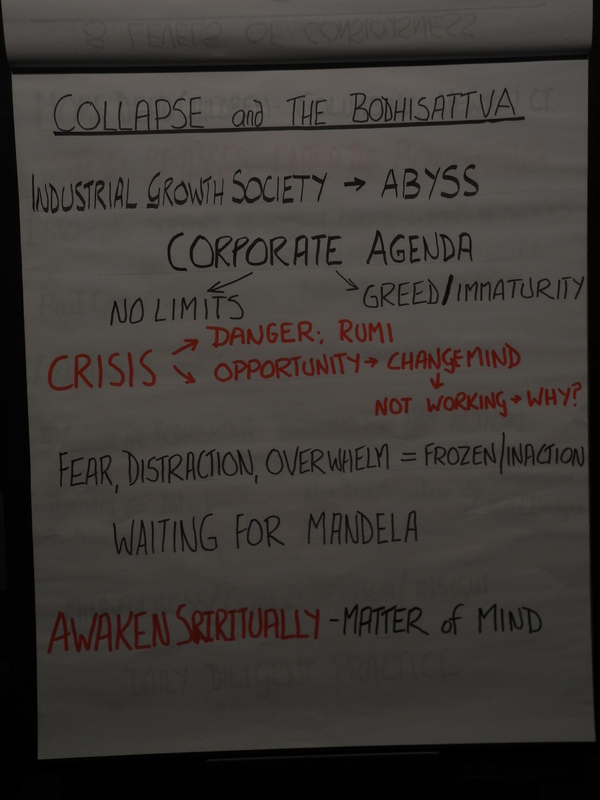 The dharma discussion was on a very weighty topic – How can Mindfulness be addressed to the crisis with ISIL? This was very challenging. The final session was a Q & A before the closing ceremony and good byes. During the days prior to leaving for home, Carolyn and I cycled ten miles each day to the Café de Paris, owned by a French family. It was interesting that our ten mile bike ride was past a series of gated communities. An omen of the times we are in, but do not have to be part of. Many of the ideas expressed in Failsafe were presented to students – both at the university and in the meditation hall. Their feedback and helpful suggestions prompted me to refine the basic ideas. I first talked about a Failsafe in Consciousness in my 2002 book The Essential Spiral: Ecology and Consciousness After 9/11, drawing on the post Enron crash where financial analysts actually talked about responsibility and ethics. I also drew on the writings of E.O. Wilson – that despite all that was happening around us there was still an unmistakable link with nature’s systems in the human psyche. So I endeavoured to improve on the ideas floated in 2002 and tried it out on my ecology class at Carleton University in Ottawa, Canada. Failsafe became more than a set of ideas. It had substance and a design based on three interconnected components. These were Innate Earth Wisdom; Counter Culture; Tipping Points in Consciousness – all of which intertwined with consciousness transformation. Can we fix the planet? This is the wrong question. Our present values and patterns of consumption are the architects of the present global ecological emergency. The right question is can we transform ourselves? My point in addressing Climate Change was that it was not the problem. The real problem was the mind-set that created the ecological conditions for Climate Change to explode dramatically into the lives of every human being on earth. I suppose it is an act of faith on my part, but I feel that once consciousness changes then different questions will be asked and different solutions found. Out of the transformation will emerge the structures and institutions that can regulate global affairs without endangering all species – including our own. Failsafe provides understanding of global eco-crises and issues a call to change the existing world order by arriving at a deep spiritual understanding of what needs to be done. Step by step methods to transform our existing mindset are laid out to usher in a new era of planetary care. Failsafe is about hope and faith and the clear knowledge that we have the capacity to get things done. There is hope for future generations to occupy a healthy planet and faith in the human consciousness to change. There is faith that we beings can awaken to the miracle and beauty of all of life. Failsafe provides examples and guidance for transformation and change. In the context of Climate Change and dire predictions for a habitable econiche for homo sapiens I present a Failsafe in Consciousness. I describe how consciousness expansion will be held in abeyance by wilful human ignorance until the global ecological situation deteriorates to a breaking point. This breaking point will then act as a catalyst, penetrating such ignorance and activating consciousness so it is propelled into expansion, deliberation and change. I drew on the new discipline of Neuroscience, the Wisdom of Aboriginal Elders and the teachings of the Buddha about changing the human mind. Taming the human mind was a major issue, because to change external circumstances with technological fixes still leaves a damaging mind-set intact. If our minds are not clear and at peace, we simply pass on our disturbance and selfishness to everything we create. I started to give talks to the most unlikely audiences and found to my surprise that most of the folks listening got the drift of where I was going. Their questions and requests for clarification enabled me to sculpt the Failsafe in Consciousness concept into a more understandable form. I want to reach every man and woman in the street, as the sheer necessity of a bottom up revolution in patterns of consumption and behaviour is necessary for the Failsafe notion to kick in. Failsafe is taken from engineering, where the term is used to describe a stop lever or valve that comes into action whenever the machinery is in danger of exploding or breaking down. As such, it is a useful metaphor for what is happening globally with Climate Change. I add to the Failsafe notion – particularly the idea of tipping points in consciousness. This is akin to the Hundredth Monkey syndrome, where once a critical mass is reached then behaviour changes across the board. In other words once a tipping point is reached there is a quantum leap of energy across the population. For humanity I set this threshold at 2% of the human population. If 2% can truly commit to changing their minds and altering their patterns in the direction of voluntary simplicity, planetary care and compassion – then this is the tip of the spear that lances through the problem of Climate Change. I turn to my teacher Thich Nhat Hanh (Reconciliation: 2010: 64) to open this essay on Healing the Inner Child. First we have to develop and nurture our mindfulness, which means waking up to the reality of our suffering that we would rather avoid. There are clear warning signals if we choose to pay attention. We get caught in our dramas and find ourselves telling and retelling our stories to whomever will listen. We also court our suffering and keep it alive. We often engage in a competitive aspect – my suffering is bigger than yours. The courtship of suffering can be an ugly romance for we enter into a co-dependent relationship, which has to be called by its true name – Addiction. Physiologically and emotionally we become so tightly tied into our suffering that we cannot be without it even though it is destroying our well being. We grasp at brief insights that “Yes – this is suffering” – but deal only with surface appearances. Yet the surface exposure has a long history of gathering momentum and energy until it actually surfaces. The small snake has become a monster. The addiction to suffering is now embedded in our mental state. We respond to any glimpse of suffering with such destructive emotion that we reinforce the causes and conditions that created the suffering in the first place. And so we continue shooting ourselves in the foot, torpedoing our lives – over and over again. Our suffering is caused by abuse – emotional, physical and sexual – and it becomes an organizing template in our mind. We then create an abusive relationship with that template’s qualities – addiction; fear; co-dependency. To stop the cycle of harm we need an OMG moment. The insight that: OH MY GOD THIS IS WHAT I HAVE BEEN DOING ALL MY LIFE. HOW DO I STOP IT? That insight has to arrive in the mind before we can apply ourselves to developing mindfulness as an antidote to the abusive relationship established with our suffering. It is an awesome realization to penetrate the darkness and realize that the abuse you have suffered has created an abusive relationship with yourself. Mindfulness practice can bring the abusive relationship to a halt. This is the required OMG moment that propels you to get to work. To go backwards from the surface and investigate the causes and conditions that placed you in such suffering. And so we learn the practices, tools and concentrations that support this journey of understanding suffering and taking care of it. We break the cycle through re-training and mindfulness practice. We equip ourselves for a journey to be well that requires our determination to practice mindfulness daily and ensure that we take refuge in wise support. Emotional, physical and sexual abuse during childhood creates a lost, frightened and frozen child within us. If we are unable to reach this lost and wounded child then we may never heal ourselves. We prefer not to remember the sufferings of childhood, so we bury them and hide. We run away from seeing deeply into the causes of our suffering. Whenever the memories arise, however fleetingly, we think we cannot handle them and deflect them into the deepest realms of our unconsciousness mind. This results in the wounded child not being seen for a long time simply because we are terrified of further suffering. Yet we have to find a way to reach the hurt child and make her safe. This means we have to get past the fear and address the suffering, realizing that it is suffering which provides the way through to awakening. Although we may now be adult, there is also a little boy in us, a little girl in us, who is so afraid and suffers deeply, no matter what kind of happy pretend face we present to life. This suffering child within our adult frame colors everything we do, generating our fears, insecurities and self loathing, wounding us in our relationships and life. That wounded child is you, is me, and we must extend a different energy to him so that the energy of childhood suffering can be understood, defused and transformed. Mindfulness is the way through to the inner child. We have to embrace him, embrace her exactlty where they are caught by the past – in fear and with anger at being neglected for so long. Moreover we have to be very skilful. Thich Nhat Hanh addressed the issue of child abuse in a Question and Answer session held in the Lower Hamlet of Plum Village, France on the 17th October 1998. Very gently he spoke about the ignorance and pain of the abuser as well as that of the abused, and stated clearly that understanding was the basis of recovery. Not blaming or feeling guilt and shame, but seeing deeply and understanding. First of all to understand that the person abusing must have lived under ignorant and deprived conditions without support, guidance or a wise teacher. So much so that the power of ignorance was stronger than the person, and thus they were driven to do wrong things. If the person abused can begin to understand just a little bit of that, then their anger, shame and outrage can transform into a droplet of compassion and through mindfulness practice their suffering can diminish. When forgiveness and understanding are there, suffering decreases. The second step he suggested was to recommend that the person abused practice mindfulness, to transform herself into a Bodhisattva and engender the compassion to help and be of service to all children who need protection. By merit of understanding the experience and recovery from abuse, such a person can practice and use their talents to promote measures to protect children. This helps to eradicate the ignorance that generates abuse. There are many techniques and methodologies of therapy that address issues of the inner wounded child. The first one I am going to describe is simple and anyone can do it. It is a first step and I recommend that it be practiced under the guidance of a therapist, shaman or spiritual teacher. You are going to start a diary or log book for you and the inner child to write to one another. The adult you will write using the hand that you normally write with. You begin by saying “hello” to Little John, to Little Allison. Then go on to say how sorry you are for having been away and neglectful; that you are grown up now and strong, and that you are going to do everything to make it safe for Little John, for Little Allison. They will be safe, loved and cherished. Write in your own words along these lines. Then with your other hand, the one you do not write with, allow the inner child to express herself. Do not edit. Just write down whatever comes out. It may well be angry, blaming and abusive words that come out, and it is your job not to be shocked or defensive but to provide constant re-assurance, love and guidance. You bring to this communication with the wounded inner child all the qualities of love, compassion and wisdom you can muster. These are the seeds of mindfulness you consciously bring to support the wounded child inside you. The energy of these seeds works on the energy of the traumatized inner child to reduce his pain and suffering. Talk to him through writing in this way – with total love and acute mindfulness. Then read your diary entries out loud – placing yourself in your adult shoes and then in your inner child’s shoes. This simple act of reading out loud is a way for both of you to be heard. On a daily basis register with how deeply your understanding and love is getting through to the wounded child, for she is listening carefully to every word and knows that you are now listening to her. You draw closer – the adult and the inner child – as you bring awareness, love and healing to the suffering and pain of the child. Details of trauma may be revealed that you did not know about, which is why you need the help and guidance of a trusted therapist, shaman or spiritual teacher. This is to support you being a wise and loving parent to your wounded child. And with time you will notice shifts and changes in patterns of expression as the child becomes trusting and starts to grow, eventually merging fully with you as an adult. (You also learn to write very well with your other hand!) In your letters tell your inner child about yourself and your life, take him on outings, treats and give to that child all the care, attention and love you feel you did not receive when you were a little boy, a little girl. The suffering will diminish and you will experience such a transformation, for you discover that your relationships with co-workers, friends and family start to change, and your fears of the past and anxieties about the future do not have the same driving force. When you notice things like this tell your inner child: “Thank you for being with me. That makes me so happy.” The experience of being with the inner child in the healing journey is a stimulus for this kind of happiness. There are times you may cry, or feel total joy and also suffer despair, which is why guidance and support is necessary on this beginning journey of reclaiming yourself. You need that wise spiritual friend and teacher to keep you steady and mindful. I know, for I went through it. I am happy to say that it worked for me, as I experienced the painfully slow establishment of trust, then the exhilarating joy of safety and integration, until finally my inner child was the adult me, integrated with a freshness and vitality that I continually treasure. Ultimately there is only one pair of shoes! To support this journey there are other practices and meditations that are valuable for the steady process of healing. We have brought mindfulness, concentration and insight to our inner child and constantly enveloped him in the refreshing energy of transformation. We have worked diligently to nurture seeds of happiness, joy and safety in the consciousness of the inner child – the same seeds that are also in us, our ancestors and descendants. When despair and fear arise from the child we have the presence of mind to listen deeply and surround the fear with the stronger energy field of mindfulness. This is a deep and beautiful process because we are no longer running away or hiding from afflictions that have rendered us dysfunctional. Thich Nhat Hanh in his book Reconciliation tells us: “The capacity to be aware – that is, to be a human being who is mindful – is what will save us” (2010: 114). Buddhist teachings contain a multitude of tools, concentrations and practices that can nurture this process. Such as The Five Remembrances, Five Year Old Child Meditation, Sutra on Mindful Breathing, Deep Relaxation, Touching The Earth and Removing The Object to mention only a few. 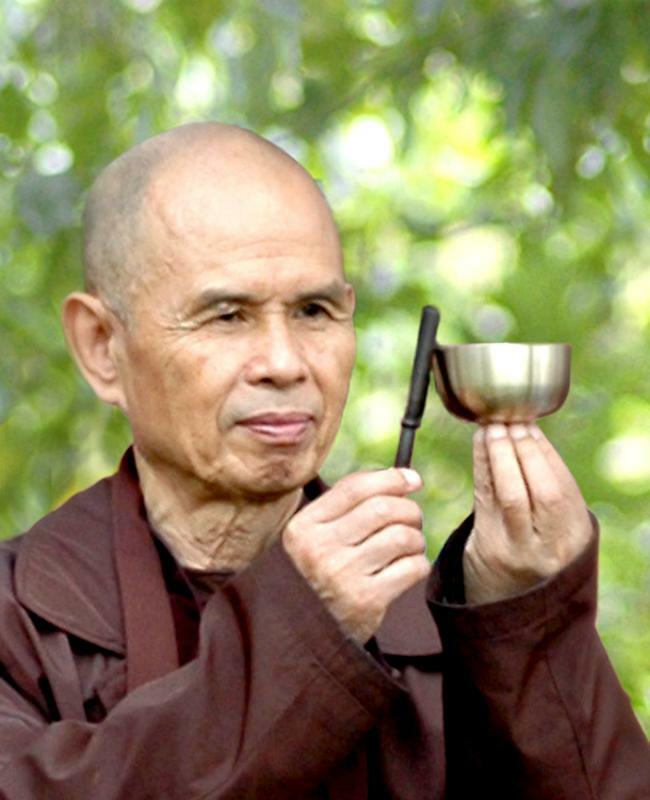 In Plum Village, Thich Nhat Hanh’s practice center in France, he has provided a much loved practice gatha for the meditation community, which begins with “I have arrived, I am home.” This is used in walking and other meditations as an instrument to concentrate on breath and be present. In this way the fears and traumas of the past and anxieties about the future do not crowd in and overwhelm the mind. The gatha with walking meditation, connected to in-breath and out-breath, provides an essential tool to take care of the many mental formations that flood our waking consciousness with fear, pain and suffering. With daily diligent practice we can examine these same mental formations but from a place centered in mindfulness. This simple gatha has become the dharma seal of PlumVillage. This is good practice, for with intelligence you use your conscious breath and concentration to heal, simply by welcoming your wounded inner child home through the practice of being present. We are capable of arriving in every moment of practice, whether it is sitting meditation, walking meditation, having a mindful meal, taking a shower or doing laundry. Being present in each moment is a way of practice that welcomes home the injured, frightened inner child harmed by abuse. In order to heal it is necessary to cultivate the internal energy of mindfulness before stopping and looking deeply into what caused the fears and traumas of abuse. The practice of arriving in each moment nurtures that strength. From the space of clarity provided by locating yourself in the present moment, not only is your inner child welcomed home, there is also the lucidity of mindfulness practice to deal with the ghosts of the past and at the same time put the ghosts of future anxiety to rest. Another tool is to adapt the Four Brahmaviharas meditation to focus on the injured inner child and is based on the Buddha’s teachings on Love. Prepare for meditation by sitting comfortably with the spine erect. Bring your concentration and focus to breath on the In-breath and breath on the Out-breath. After ten or twenty breaths, whenever you feel calm and stable, begin by bringing each of the components – Love, Compassion, Joy, Equanimity – into yourself, the adult you. The next sequence now provides a focus and concentration to water the seeds of Love, Compassion, Joy and Equanimity within your inner child. Out-breath to my inner child. The Buddha says if we gather together all the virtuous actions we have realized in this world, they are not equal to practicing love meditations………If we collect together all the light from the stars, it will not be as bright as the light of the moon. In the same way, practicing love meditation is greater than all other virtuous actions combined. There are many other methods of meditation and practice that could be documented here. I felt it appropriate to indicate some of the ones I used to good effect in my process of healing. These were practices that accompanied the shamanic healing conducted in an Altered State of Consciousness (See Healing Journeys in Portals and Passages – forthcoming). One factor that was very important is that I was determined to heal once understanding dawned in my consciousness. From that awareness I took specific steps and relied on wise teachers, medicine women and steady friends to help me along the path of healing and transformation. I must emphasize that this is not a journey that can be taken alone, so do ensure that you have support from your sangha and good guidance from a therapist, shaman or spiritual teacher. It all started on a bitterly cold winter evening ten years ago, as the Iraq war loomed. I received notice that a Peace Song Circle was happening on Parliament Hill. So I went, accompanied by my wife Carolyn and our dog. No-one else turned up. I remarked to Carolyn, “This is a good idea – it just needs to be organized.” She replied, “Let’s do it.” And so we did. It was Pine Gate Sangha that created the nucleus for Friends for Peace Canada. It quickly grew to a loose coalition of 50 organizations and we asked them to begin the peace process first of all with themselves, then to the community and the world. Our mandate evolved so that we gave annual Peace Grants to local and international organizations making a real difference, as well as working in concert with other coalitions in the city for environmental and social justice issues. I also decided at that time to concentrate my energy and efforts locally, feeling that these efforts could infuse global networks from the epicentre created there. I had received many invitations to be a global speaker and teacher, yet felt that a concentration on my home city of Ottawa was the primary focus. I responded to the many international invitations with a gracious decline. Though my ego was certainly miffed by the prospect of lost opportunities, I was inspired to devote my time and energy to moving things just a little bit in my city, so that more good things could begin to happen spontaneously. As I soon discovered, there were many good friends across the city more than happy to make this possible. We organized 5,000 participants at the Peace Song Circle on Parliament Hill in Ottawa, held on a miserably wet, cold spring day in 2003. A sea of multi-coloured umbrellas on a rain swept morning welcomed all those gathered. As other peace protests joined us and sang “All Within Me Peaceful,” the crowd covered the grounds of Canada’s seat of government, all meditating at the end in total silence as the rain poured down on our heads. The pouring rain was strangely welcome, for it symbolized the tears of Iraqi children, my tears, your tears – transformed into hope through singing for peace with one another and experiencing deep peace. There was a transformation of anger, anguish and violence into a determined clarity to be peace and to oppose war. From there we know the wise actions to take. Those who are waging war would do better if they knew better; but they don’t know better. We, however, do know better and must take the steps to communicate our understandings to political decision makers. It is our developed consciousness, which allows us to know better. It is the meditative work we do on ourselves every day of our lives to come to terms with the inner struggle, turmoil and trauma – the inner war which we must learn to identify as our own; to find ways to transform our often raging thoughts. *Peace Award recipients Bonnie Cappachino (2004) and Bruce Cockburn (2006) in their Vision Speeches ripped into government foreign policy. Dr. Peter Stockdale (2010) held City Council to account for inter-ethnic violence and neglect in Ottawa. 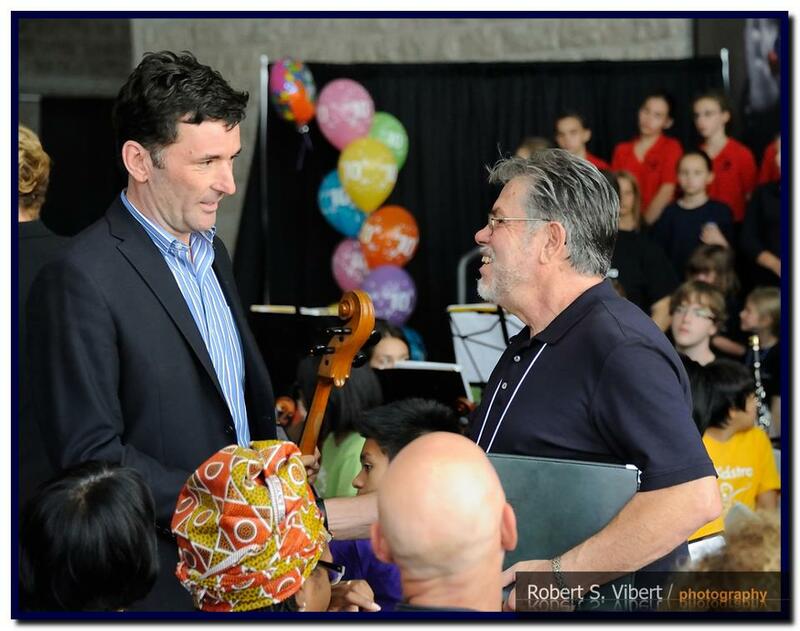 * In 2010 Clive Doucet, candidate for Mayor, not only danced a great number with Big Soul Project, he gave a stirring speech on Cities of Peace – a vision for Ottawa. I asked the crowd if their light was fierce and were they ready for tomorrow’s child, not yet born. This child has difficult questions – “What did you do when there was still time to create a sustainable world?” “On your watch, was there intelligent life in humanity’s leaders and decision makers?” A resounding affirmative was delivered by the diversity gathered on this day. Peace Awards are given annually to outstanding citizens. Grandfather William Commanda, Max Keeping, Bruce Cockburn, Dave Smith, and Elizabeth May to mention only a few. Our mandate for peace, planetary care and social justice was solid throughout the day – at the Welcome and Community Tables, the Silent Auction, Connection Centre and Servery. People left at the end of the day feeling uplifted, confident and connected. * This year 2013 – there will be music, speeches, dancing, fabulous food at the Servery, and a chance to learn and connect. The day opens with Orkidstra followed by the Dandelion Dance Company. These young people signal that we have a future. Peggy Taillon will talk about the Hera Mission in Kenya. And all-time favorites, Big Soul Project, close the morning program by raising the roof with their exuberance and joie. The Lunch Break is an opportunity to browse the Silent Auction, visit the community tables, check out the Connection Centre and enjoy the country bazaar nature of the event. The afternoon program begins with a First Nations theme – Asinabika Drum Circle and Idle No More. The 2013 Peace Awards will be presented to architect and visionary Douglas Cardinal and to curator Dr Amber Lloydlangten and her team at the War Museum for their magnificent Peace Exhibition. From Montreal – a great band with Sonja Ball and Friends, followed by Lucille Hildesheim on Celtic Harp. Samba Ottawa close the day with their rhythmic magic. Get there early for the opening with Orkidstra. Doors open at 10.30am. Entrance is by donation. All funds raised enable Peace Grants to be presented every year to organizations making a difference in our city and internationally. The intent is to create a different form of peaceful expression that appeals to a wide cross section of Canadian citizens who want to create infrastructure in our institutions that value peace and planetary processes. I love my summer job. It is such a rewarding experience. The 10th Anniversary of Friends for Peace Day was awesome, uplifting, mindful, and packed with people seeking pathways and bridges to build a better world. The onstage performers were outstanding, highlighted by the world premiere of “To Young Canadians.” A tribute to Jack Layton performed by Orkidstra. Olivia Chow received a posthumous Peace Award on behalf of her late husband Jack Layton. June Girvan and Koozma Tarasoff were also honoured in 2012. Our mandate for peace, planetary care and social justice was solid throughout the day – at the Welcome and Community Tables, the Silent Auction, Connection Centre and Servery. Reflected onstage by the Dandelion Dance Company, Big Soul Project, Orkidstra, Peace Awards Ceremony, Bhakti Connection, Samba Ottawa and the rock/blues band SLYDE who closed out the day. People left at the end of the day feeling uplifted, confident and connected. It all started on a bitterly cold winter evening ten years ago, as the Iraq war loomed. I received notice that a Peace Song Circle was happening on Parliament Hill. So I went, accompanied by my wife Carolyn and our dog. No-one else turned up. I remarked to Carolyn, “This is a good idea – it just needs to be organized.” She replied, “Let’s do it.” And so we did. It was Pine Gate Sangha that created the nucleus for Friends for Peace Canada. It quickly grew to a loose coalition of 50 organizations. Our mandate evolved so that we gave annual Peace Grants to local and international organizations making a real difference, as well as working in concert with other coalitions in the city for environmental and social justice issues. We organized 5,000 participants at the Peace Song Circle held on a miserably wet, cold spring day in 2003. A sea of multi-coloured umbrellas on a rain swept morning welcomed all those gathered. The crowd covered the grounds of Canada’s seat of government, all meditating at the end in total silence as the rain poured down on our heads. The pouring rain was strangely welcome, for it symbolized the tears of Iraqi children, my tears, your tears – transformed into hope through singing for peace with one another and experiencing deep peace. There was a transformation of anger, anguish and violence into a determined clarity to be peace and to oppose war. From there we know the wise actions to take. It is our developed consciousness, which allows us to know better. It is the meditative work we do on ourselves every day of our lives to come to terms with the inner struggle, turmoil and trauma – the inner war which we must learn to identify as our own; to find ways to transform our often raging thoughts. What comes to me after my busy mind becomes quiet is that now more than ever we must go deeper into our spiritual processes, become more disciplined in our mindfulness practices, AND be more active in our social and political structures. The tools are everywhere to be found: meditations to balance the hemispheres of the brain, to develop the skills of deep listening, for grounding and centering, for strengthening the nervous system, for coming to terms with what is truest in our heart. Non-dualistic approaches emphasize that we are in the twenty-first century. Old forms of protest created in the previous century no longer work. Furthermore, this preference welcomes many citizens who choose not to participate in violent protest rallies. The inclusiveness of our efforts is to provide the example from within ourselves for what we hope to see replicated on the national and international stage.